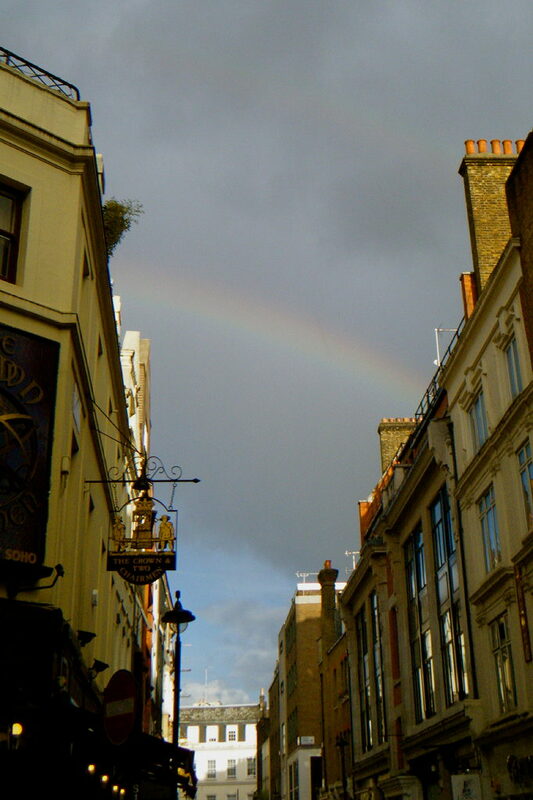 On the way back from the British Museum yesterday, this was the scene over Soho. Nice to see photographic evidence that a person of stamina may return from visiting cloistered antiquities in the British Museum, yet still lift a head to admire some heavenly freshness being showered over the antique chimneypots of Bloomsbury. But you really ought to treat your eye to a higher res camera: they can be quite light (for instance, the Sony iPhone with Zeiss lens has 12 Meg). And yet that posted image is striking, even though 120 kB is barely sufficient to match the subtlety of Nature’s fugitive inks. The image is just a low-res, ‘saved for the web’ version of a photo taken on my young son’s camera which he very kindly loaned to me — so, more a case of reminding myself of the moment than matching its impact. Lovely photo, and from an angle that makes Soho look very stately and respectable. However, I can’t help wondering whether that rainbow dips down onto Old Compton Street. Gareth, on balance I suspect that at the end of that particular rainbow there was probably a pot of udon noodles, a la Tokyo Diner — I didn’t stick around to check, though, as it was actually raining incredibly hard at the time, with rain literally running off the camera — something else the admittedly dodgy quality of the photo doesn’t really reflect! Regards On Your Grabbed But Inspirational View.